If you're traveling to Los Cabos with the little ones, you'll appreciate the convenience and fun of Kids Clubs at various area resorts. Need a little break from the kids while you're out golfing or enjoying a massage? 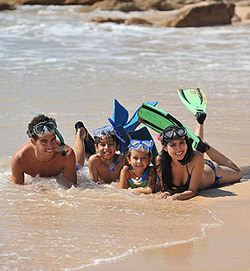 Many Cabo resorts offer complete activities programs for the smallest guests. Each resort's program varies, so be sure to check ahead of time for age requirements, hours and schedules. Available resort activities for children include arts and crafts, music, games, supervised water activities, meals and more. Dreams Los Cabos offering an Explorers' Club for kids aged 3-12 from 9AM to 10PM. Villa del Palmar Beach Resort boasting a Kids in Paradise program for children aged 4-12 from 9AM to 8PM. Fiesta Americana Grand offering the Fiesta Kids Club for kids 4-12 from 9:30AM-5PM. These are only a small sampling of the many outstanding programs for children vacationing in Los Cabos, Mexico. Professional babysitting services are also available. Please contact us for more information on kids activities in Cabo.